It is, as best I can tell, a traditional hair removal remedy from the middle east–Iran and Turkey, specifically. Of course, what exactly the doctors were actually experimenting with or about, who knows. My experiment on human subjects with this product produced a nearly 100% response rate of “WTF.” And I just showed them a picture. Of course, it’s actually “100% natural ANT EGG OIL, but hey, it’s natural so it must be safe! Like…Hemlock! Or tetrodotoxin! Q: Is this ant egg oil smell like ant ? A: No. It doesn’t smell like ant. 3. Excelsior! Enjoy not having hair! Part of the marketing pitch is that it is safe for babies. In fact, putting it on babies specifically to prevent growth of hair is part of how this product is promoted. Which, I suppose, is quite effective for about 14 years. Lest you think that I am just making fun of an internet site put up by someone whose first language is clearly not English, I want to point out this much more upscale version, that pretty much repeats all the same marketing lines, with the same lack of evidence. Although they use numbers and percentages to make it look even more sciencey! The breakthrough GUTTO Ant Egg Oil Cream reduces the amount of hair in the applied area by 65%, delays the re-growth by 75% and weakens by 46%. It is a completely natural product found as a result of scientific and dermatological tests. What I really want to know, but can’t find anywhere, is information on the manufacturing. What kind of ant eggs? And how do they get the eggs??? If, indeed, their claim that a protein in the ant eggs destroys the root of the hair is true, you are going to need a LOT of ant eggs in order to have enough to sell in creams. Also, in general, my experience is that ants can get quite cranky about you taking their eggs. Of course, WHY anyone thought rubbing ant ova on their skin would reduce hair growth remains an unanswered question. I wonder this about a lot of things. Where in the world did people come up with the idea of grinding up beans and then steeping them in boiling water and then drinking the water? Or look at the process for making cocoa. Take the beans out of the pod, let them ferment, grind them up and then mix the stuff up with things. (BTW, this is all-natural, right?) That’s just a couple of foods. I have always wondered how in the hell someone figured out that this coffee was tasty. This really does sound like something that an actress might do (along with her kelp tape and self-help book). I am aware that not all actors/actresses are mental and that insanity in Hollywood is not limited to actresses but I’ll also admit that I have been watching A LOT of Archer recently and the episode “movie star” has a great deal of silliness that involves this sort of new-age, self-help, all-empowering stuff (like kelp tape and self-empowerment books) with an actress/double agent. When a hobby and a passion converge, it is something that sticks around in my mind for quite a while. On a more directly topical note, I am sad to find it so easy to believe that people are fooled by a hair removal product that you SHAVE BEFORE USING. Even some of the sillier stuff gets me to the core in a special way. If people are fooled by such ridiculous things as rubbing ant ova into their skin, how much of an uphill battle will we be fighting to get people to, say, stop giving exorbitant amounts of money to chiropractors and homeopaths who have the placebo effect to help back their dodgy claims? If only I’d realized that people wanted that smooth look of exoskeleton first. I’d be rich! I can’t help but feel that this fake science crap is particularly rampant with products marketed specifically for women. I am always amazed at shampoo/conditioner, makeup, and cleaning product commercials where they show random “sciency” graphs or models that DON’T MEAN ANYTHING. They also seem to think that if they slap the word “technology” randomly throughout the product description it makes something immediately desirable. It’s downright degrading, like marketing people don’t think that women can see past this shtick with their poor science and math abilities. RANT RANT RANT. 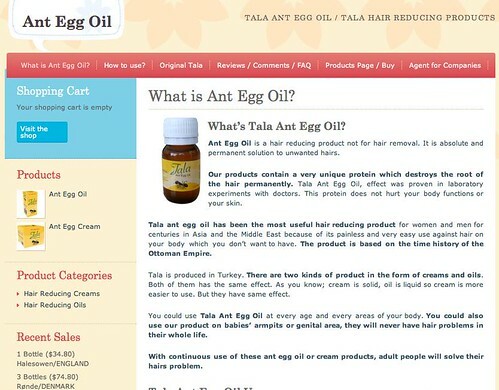 And your analysis of this Ant Egg Oil is absolutely hilarious. I’m almost positive there were studies done on this. Is there a technological fallacy to go with the naturalistic fallacy? I love how they use “It’s Hi-Tech” in the same ad as “It’s All Natural”. And thus the need for Skepchicks. When is that last time you saw a motor oil commercial, or a high-end dog food commercial (the Blue Buffalo one makes me ROTFL), or a beer commercial. Advertisers are professional liars, it’s just the way it is. It does seem to be particularly heinous in the “health and beauty” industry; though that is increasingly not aimed just at women. I imagine there is either one very large ant farm, or very little ant “goo” in the cream. It is my understanding that ants don’t have hair, so there must be something in ant eggs that prevent ants from growing hair. Something like ant egg DNA perhaps? It is well known that males can cause hair to grow on the palms of their hands by rubbing mammalian non-egg DNA on them. I should give a credit to the spelling though, the writings on the box indeed Turkish and spelled correctly. Apparently this is also something new in Turkey It became popular in the last year or so, mainly promoted by Jenny McCarth equivalents of Turkish media. Bunch of brands appeared in a very short time and became quite popular among women. Lateley, due to increased complaints from users(mainly skin irritation and chemical burns), ministry of health conducted an analysis and the analysis revealed that the oil in different products was either a petroleum derivative or sunflower seed oil. The products are now banned and recalled from retail markets. Here are the links,in Turkish unfortunately but google translate would give you a general idea of the content.